Bahrain’s King Hamad bin Isa al-Khalifa has announced a “foreign plot” against his country was thwarted by the military intervention of forces under the command of the Gulf Cooperation Council (GCC) (Global Arab Network, March 21; VOA, March 21). The deployment was apparently carried out without consultation with Washington though short notice was given (AFP, March 14). A rare moment of agreement was seen in the responses of Washington and Tehran, with U.S. Secretary of State Hillary Clinton suggesting the “alarming” intervention was “not the answer” to Bahrain’s problems, while the Iranian Foreign Ministry described the intervention as “unacceptable” (CNN, March 17; Tehran Times, March 16). The GCC deployment indicates the Arab states of the Gulf region obviously feel more comfortable providing military support to regimes like Bahrain’s than revolutionaries such as those fighting in Libya. The GCC member states, Kuwait, Saudi Arabia, Qatar, Bahrain, Oman and the United Arab Emirates, define security as a collective responsibility and therefore reject criticism from the UN and elsewhere that the arrival of GCC forces in Bahrain was a “foreign military intervention.” This stance has been supported by the Arab League, which described the entry of GCC troops as “legitimate” (WAM – Emirates News Agency, March 22). The Peninsula Shield Force (PSF) draws on troops from GCC member states and has fluctuated in size since its creation in 1982, ranging from between 5,000 men in its early days to a current total of nearly 40,000 troops including infantry, artillery, armor and combat support units with a permanent base at Hafar al-Batin in Saudi Arabia. The PSF was created as the military wing of the GCC in response to the threat posed by the Iran-Iraq war of the 1980s, which threatened the security of the entire region. Pledged to protect the security and territorial integrity of member nations, the PSF was first mobilized in 1986 during the battle between Iran and Iraq for the Faq Peninsula, which brought the fighting dangerously close to several Gulf states and threatened oil exports. After PSF troops were deployed in Kuwait during the second Gulf War of 1990-1991, the PSF intensified its efforts to transform itself into a highly coordinated, well-armed and thoroughly trained force capable of responding quickly to security threats (al-Sharq al-Awsat, March 16). The PSF was again deployed in Kuwait in 2003 in the lead-up to the U.S. invasion of Iraq. 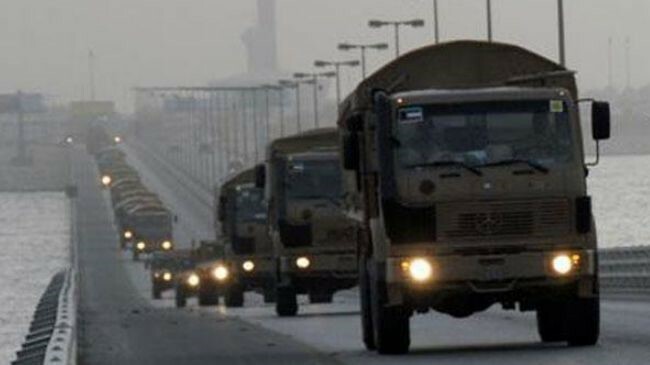 A PSF detachment of 1,000 mechanized Saudi troops and 500 police from the United Arab Emirates (UAE) crossed the causeway into Bahrain on March 13 in response to a request for military support from Bahrain. Qatari Colonel Abdullah al-Hajri has confirmed Qatari troops have joined the PSF in Bahrain, but did not elaborate on the size and composition of their contribution (AFP, March 18). 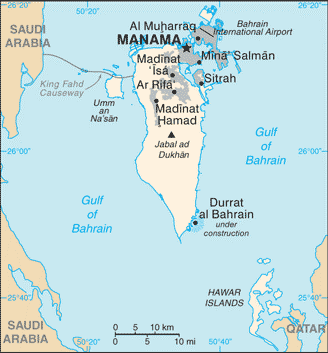 Kuwait has also announced it is sending a naval group to protect Bahrain’s coastal waters (Watan [Kuwait], March 18). In Bahrain, the PSF has been tasked with protecting infrastructure such as power stations, oil facilities and government buildings as well as maintaining law and order (Saudi Gazette, March 15). Prominent Shiite cleric Shaykh Issa Qassim, a major supporter of the protests in Bahrain, told worshippers on March 18 that the GCC troops could be put to better use defending Palestinians in Gaza from Israeli attack than patrolling the streets of Bahrain (Arab Times, March 18).An opposition statement described the PSF’s arrival as “an overt occupation of the kingdom of Bahrain and a conspiracy against the unarmed people of Bahrain” (al-Sharq al-Awsat, March 15). The PSF is led by joint forces commander Major General Mutlaq Salem al-Azima, who told al-Arabiya the PSF has no intention of interfering in Bahrain’s politics: “The role of the troops is to protect strategic sites, whether marine or air bases, as well as military camps outside the cities and they do not take part in Bahrain’s internal affairs… The troops will stay until foreign [i.e. Iranian] threats are warded off. Till this happens, the troops will remain to serve the military leadership of the kingdom of Bahrain” (al-Arabiya, March 23). The commander of the Bahrain Defense Forces, Marshal Shaykh Khalifa bin Ahmed al-Khalifa and National Guard Commander Lieutenant General Shaykh Muhammad bin Isa al-Khalifa, both members of the ruling family, inspected the PSF forces on March 23, where the BDF commander praised the work of the GCC troops in deterring threats to Bahrain (Bahrain News Agency, March 23). Iran’s president, Mahmoud Ahmadinejad, denounced the GCC’s military intervention and accused the United States of sponsoring the action: “Regional nations hold the U.S. government accountable for such a heinous behavior… The U.S. seeks to save the Zionist regime and suppress popular uprisings. So, it supports certain governments” (Press TV [Tehran], March 17). In a letter to the UN, Iranian Foreign Minister Ali Akbar Salehi asked: “How could one accept a government to invite foreign military forces to suppress its own citizens?” (Arab Times, March 18). Bahrain, which blames Iran for the unrest, withdrew its ambassador to Tehran in protest (Bahrain News Agency, March 15). The Saudi embassy in Tehran and a consulate in Mashhad have since been attacked by Iranian demonstrators opposing the PSF deployment in Bahrain (al-Sharq al-Awsat, March 21).